It’s a big week for PowerCLI! We’re closing out 2018 with several new releases. 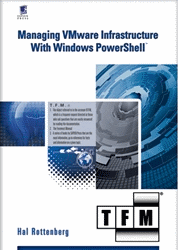 The new PowerShell DSC Resources for VMware came out last week. PowerCLI 11.1.0 was released earlier today. Now, we also have a brand-new Fling to help bridge the gap between the low-level cmdlets already available and the high-level cmdlets that are so easy to use. The PowerCLI Preview for VMware Cloud on AWS adds 14 new high-level cmdlets which are used in combination with the existing VMware.VimAutomation.VMC module. Why is this being released as a fling? Much like the NSX-T preview module released earlier this year, we’re trying a new approach to creating cmdlets based on the APIs. Essentially, we take the VMC API swagger specification and programmatically create the entire module. It’s early in this new development process and we know there is the potential for issues and things that may or may-not make sense. Another reason for it being a fling, we need your feedback! What cmdlets are you using the most? What should the output look like? What cmdlets aren’t working the way you think they should? What cmdlets are missing? As well as any other feedback you can come up with! The preference is to leave the feedback on the Fling’s comments page. However, if you post it as a comment here, I’ll make sure the right people receive it. Before we dive right in, the following section is going to be using a Windows environment. However, both the existing VMC module as well as the new VMC Preview module are multi-platform and can be used with PowerShell Core! We are now authenticated and ready to start pulling information from the environment. Following along with the prior blog post, let’s start by pulling information about our organization. We can do that with the Get-Organization cmdlet. There’s a great new fling available called the PowerCLI Preview for VMware Cloud on AWS. This fling adds an additional 14 high-level cmdlets for VMware Cloud on AWS, like Get-Organization and Get-Sddc, which means that automating VMware Cloud on AWS has never been easier! This entry was posted in General and tagged Fling, PowerCLI, VMWonAWS on December 20, 2018 by Kyle Ruddy. PowerCLI Core Fling – Available For Download! I am extremely excited to announce that the PowerCLI Core Fling has been released and is available for download! Before getting to the download link, let’s cover a couple things first. This release is based on, and requires, Microsoft PowerShell Core and .NET core. If you do not already have it installed, see the accompanied documentation for a walkthrough on getting started. Feedback is very much welcomed. Please use the Fling site’s comment section to submit feedback. Keep in mind, we improve the product based off of your feedback, so please do let us know! Enjoy, and don’t forget the feedback! This entry was posted in General and tagged Fling, PowerCLI, PowerShell on October 17, 2016 by Kyle Ruddy.